Steinberg has just launched the Cubase 9 series. Here’s what new in the update and everything you should know about Cubase Pro 9. As always, there are three new versions of Cubase 9. Cubase Pro 9, Cubase Artist 9 and Cubase Elements 9. If you previously owned a copy of Cubase, you have options to upgrade as well with different upgrade prices depending on the Cubase version you’re currently on. Potential Money-Saver: Cubase Pro 9 is selling at €449. However, you could potentially get Cubase 8.5 Educational edition for $329 (€305) and then try qualifying for the grace period upgrade if you activated. Or you could just upgrade at €99, and it’s still cheaper if you were to buy the full software. On the first glance, it seems that Cubase Pro 9 has stolen the layout from Logic Pro & Ableton. The new ‘Lower Zone’ where your mixer or audio editor sits integrated with the arrangement management window, looks awfully similar to Logic Pro. That said, if you have used Logic before, you’ll know how user-friendly the ‘Lower Zone’ is. So putting copying ideas aside, this is a nice addition to Cubase. Cubase has always been a solid contender in the world of DAWs. The program has also gained its reputation as one of the industry standards. One of the biggest annoyance I found with Cubase on a Windows computer is that I’ve to restart Cubase every time I decide to plug in a MIDI controller. Cubase doesn’t scan USB devices when it’s running, so if you had to plug in a controller in the midst of a session, you had to exit Cubase and relaunch it again. In Cubase 9, they finally addressed that. USB MIDI devices will finally be recognized when plugged in while Cubase is running. Hallelujah! The new sampler track will excite EDM producers or just anyone who loves tweaking and experimenting with sound. All you have to do is simply drag a sample from the arranger to the sampler track. A new sampler track will be automatically created, and you can play the sample on your MIDI controller, turning your sample into an instrument instantly. From there, you can manipulate your sound with audio warping, filter, pitch and also amp. Very much like Ableton Live, every tweak can be automated so you could put in automations on your sampler track. On top of that, the new sampler track comes with Caleidoscope, a sample library with hundreds of samples and presets, tweaked for sampler track, so you could start right away without having to dig for samples. The new frequency EQ plugin wowed me with its Mid-Side support and linear phase mode for each band. In the M/S mode, each curve splits into two, so you can control the mid and side. This alone is an amazing EQ feature that even some paid EQ plugs do not have. There is a total of 8 bands you can play with, giving you lots of room to cut or boost your frequencies. Another addition is a musical keyboard on the EQ, which would be useful to help you find the right tone to cut or boost. This is useful for producers who wants to visually cut/boost frequencies, finding the exact tone or note to adjust. 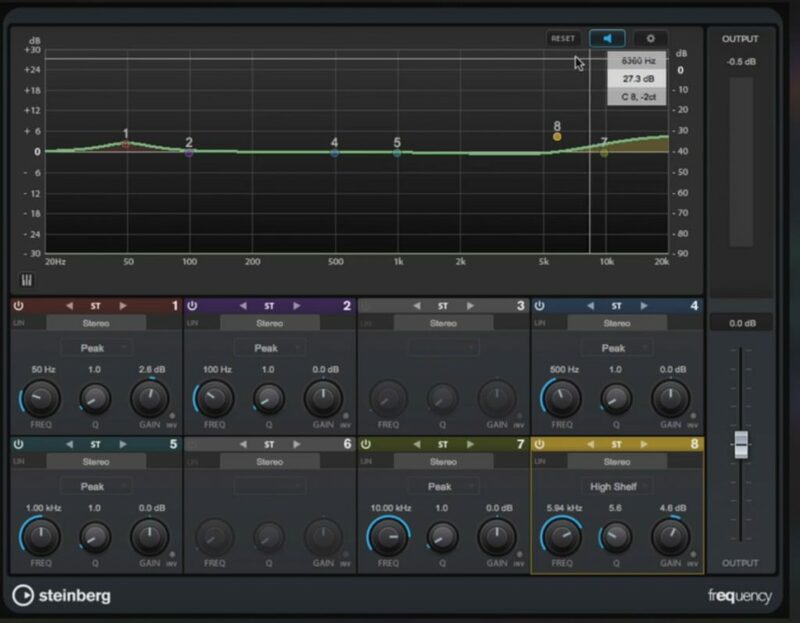 Great for doing EQ-ing during the tracking stage to mixing and mastering, the catch to frequency EQ is that it’s only available in Cubase Pro. Cubase was one DAW that did not support the undo/redo function on the mixer. It seems like they took user requests seriously this round and decided to add in MixConsole history support. Now you can compare your mixes with a single mouse click. Looking near similar to the edit history found on Adobe Audition, the new MixConsole history lets you choose several stages of your mixing process and edits you’ve done. The new maximizer plugin should be ideally used during the mastering stage. Compared to the former Cubase Maximizer plugin which only has very limited controls, the new Maximizer went through a whole in-depth algorithm overhaul. While you can still choose the ‘classic’ mode to retain the old Cubase maximizer sound, now there’s a new ‘modern’ algorithm built in. A recover control influences the initial release phase directly after the attack. It is used to retain the punchiness and sound transients, just like ‘transient ‘recovery’ on Izotope Ozone 7. Speak about the loudness war, with the maximizer plugin; you can now aim to create louder mixes and do some soft mastering within Cubase itself. The multiple marker track feature would excite film scoring producers, although there’s only a maximum of ten. You can put in dedicated markers for up to 10 tracks and structure your project in a way never before. The best part is you can export audio stems and mixes using the cycle marker ranges. Before you could only export a single marker, but this opens up to multiple exports at one go. Seriously useful if you find yourself constantly exporting audio and working between different DAWs. Cubase 9 runs in a 64-bit environment. While this would be a great leap in terms of memory problems when using 32-bit VSTs, this means you’ll need a 32bit to 64bit plugin adapter like Jbridge to run older 32bit plugins. It’s nice to see how Steinberg listens to their customers and implements updates based on customer requests. While some users are reporting to have issues on using Cubase 9 on Mac Sierra, most comments online have been positive. The new features look tempting for anybody who has been on Cubase for some time. However to upgrade or not, is very subjective. In my personal view, I can already produce great music on the older version of Cubase (currently on Cubase 7), so I don’t see a very big reason to upgrade to the latest all the time. Call me old fashioned, but at the end of the day, it’s the music and not the software that matters. What are your thoughts? Would you be upgrading? Let me know in the comments below.